COMMUNITY YARD SALE THIS SATURDAY AT SMITH PLAZA! Pottstown Area Health & Wellness Foundation for providing bottled water for today’s event. Partnering to improve health, social and environmental conditions. Santa is coming to Pottstown for the Pottstown Downtown Improvement District Authority (PDIDA) Hometown Holiday Celebration! On behalf of Santa, his elf PDIDA Chairman Sheila Dugan is inviting all to downtown Pottstown on Friday, December 2nd starting at 6:30 p.m. for a night of family fun and shopping bargains. The night’s activities will kickoff with Santa’s arrival via a fire truck from Washington Street to Smith Plaza, where the Pottstown Roller Derby Girls will be collecting letters for Santa. At the plaza, once Santa arrives, a candy toss will be held in the grass in the back area of Smith Plaza. Be sure to join in, there will be special candy with vouchers for cash and free items throughout the downtown! We will do the tree lighting after the candy toss and the BarberShop Quartet will be singing Carols. Then children can have their photo taken with Santa for $7 each. The Public Library will be hosting Story time at TANGO (139 High St) every half hour starting at 7:00 p.m.
Santa house open – be sure to check out the local artist’s (Alan McBain) coloring book which features local merchants. This is a great way to see some of the merchants in town as well enjoy coloring with your children. This is sure to be a collector’s item! Photos for $7.00 each can be bought. Hometown Holidays Brunch – your choice at the Farmer’s Market, featuring the various foods available at the market – home made and fresh! Also Juan Carlos is adding a Mexican flare to the affair. Call 610-323-5400 for reservations before December 12, 2011. Tickets are necessary and must be pre-purchased. Carousel of Flavor & Murder Mystery Theater in downtown Pottstown today! The region’s premier food festival – Carousel of Flavor – is taking place from noon to 4 pm in downtown Pottstown today. Last year over 4,000 people attended. Keep the fun going on your day of rest and walk a couple blocks to 245 High Street by 3 pm for the start of TriPAC’s production of A Brush with Death: The Flossing of Chester Basil. It runs this weekend only so this is your last chance to catch this murder mystery that’s sure to be an interactive adventure for the whole family! Peter Pan, A Musical Adventure is in its final days at the Tri-County Peforming Arts Center! It runs through this Sunday, June 19. TriPAc is located at 245 E. High Street, Pottstown, PA 19464. This is the U.S. premier of a new version of Peter Pan, and, yes, it’s happening right here in Pottstown. Go to TrIPAC.org to order our tickets online now. You won’t want to miss it! Get out of the gate early on Saturday, June 18 and check out the Pottstown Soap Box Derby race, sponsored by the Ambucs. It will take place on the Wilson Street hill off Farmington Avenue. Area kids will compete for the chance to run in the All-American Soap Box Derby in Akron, Ohio. A Summer Solstice Celebration is happening at Smith Plaza tomorrow, June 18. It includes The Gallery School’s community yard sale and lots of live music. WPAZ will be broadcasting live from 10-noon. The Celebration also includes the 2nd Annual PottsMUTTster Dog Show from 9:00am to 2:00pm at Smith Family Plaza, right in front of Borough Hall in Pottstown, PA. Bring your pooch and compete for such honors as Best Singing Mutt and Best Mystery Mutt. REGISTRATION is from 9:00 am to 11:00 am. EVENTS take place from 11:00am to 2:00 pm. It all benefits the Montgomery County SPCA. Also taking place tomorrow at Pottstown’s Riverfront Park is the 2nd Annual 5K/1M Race to Shelter the Homeless sponsored by Wings of Victory Outreach Corp. Riverfront Park is located at 140 College Drive. Registration starts at 7:30am – Race starts at 8:30am. There’s a $30 registration fee – Moms & Dads with strollers are welcome! Wings of Victory Outreach Corp. was formed to provide housing and life skills training for homeless or near homeless individuals. They offer a holistic approach and give a hand up by offering programs that develop self sufficiency through housing, employment, education, and character building. 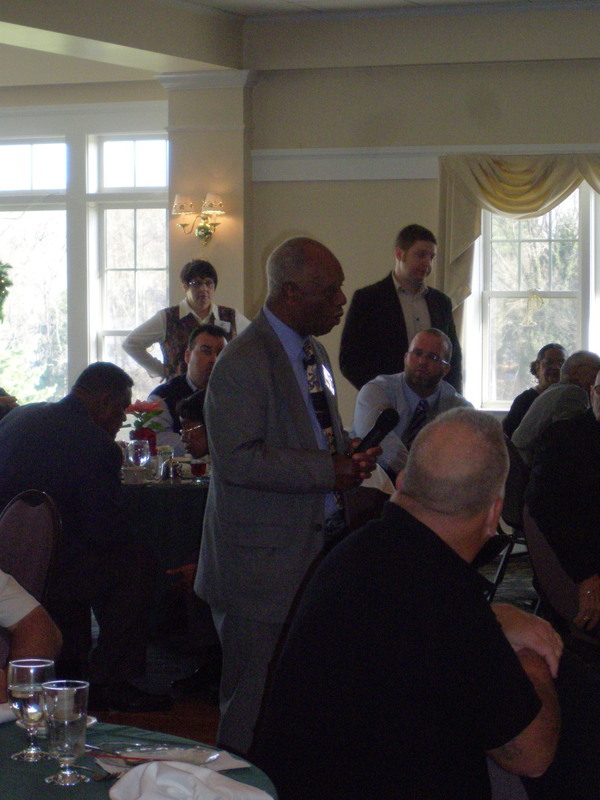 Participants gain the skills needed to function responsibly and effectively in daily life. And when you’re ready to unwind on Saturday night, head on over to Sunnybrook Ballroom for their weekly “Hot Summer Nights” at The Tiki Hut. There are drink specials, music and dancing for the 21 and over crowd. Sunnybrook is located at50 N. Sunnybrook Rd,Pottstown. Check out all their upcoming music and entertainment at http://www.sunnybrookballroom.net. You can read the rest of her thoughts on her blog, Yoga Wisdom for Everyday, which is also a Mercury Town Square Blog. There is still time to get involved with Yoga on the Steps: you can donate to the Tri-County for a Cure team or even sign up to participate on Sunday. Just visit www.yogaonthesteps.org to get the details. I actually kicked off my Hometown Holiday Celebration by dropping in on the tail end of the Pottstown Firebirds luncheon at Brookside Country Club. The reminiscences were in full swing. I just love hearing stories about antics from days-gone-by and this crew had plenty of them. Later, there was more schmoozing with the team at The Gallery’s Open House. You might want to consider purchasing a poster, “Hometown Heroes,” which honors that championship team and was painted by local artist, Mary Ellen Christ. The Gallery also has a wealth of unique gift items in every price range. Last year I got my mom a stained glass cross that hangs in her kitchen window, catching the morning light. It’s something to reflect on every single day. I’ll be back in town this week to do some shopping & I can’t wait; you never know what you’ll find! 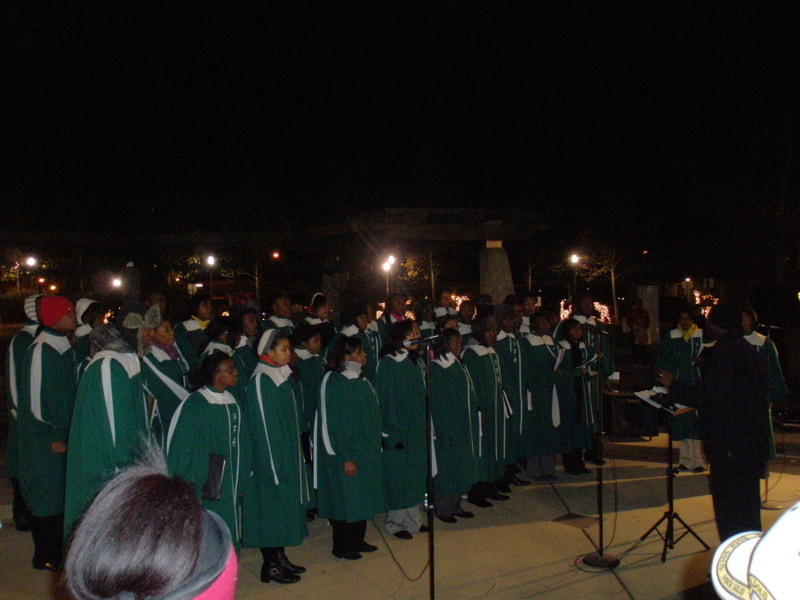 After I left The Gallery, I heard the Pine Forge Academy Choir down at Smith Plaza and caught up with some folks – there was a very nice crowd there all night long. But before too long, my toes were going numb. No matter – I just hopped across the street to Churchill’s and got a melted cheese and tomato pannini. That hit the spot. Churchill’s is so beautifully decorated, and there was a steady crowd as people purchased tickets for the horse-drawn carriage rides. There was a line all night, so get there early this Friday, Dec. 10th so you don’t miss the chance for a charming ride down High Street. Holidays kick into high gear in downtown P-Town! Okay, it’s official: There’s a lot on tap during the month of December, and we here at Positively!Pottstown want to do our part to make your head spin. Please check out the updated calendar here and check back every few days because I’m sure I haven’t gotten everything in there yet. For one thing, I’m still nailing down the details of my own High Street Holiday Hop, but rest assured, it IS happening this Friday, December 3rd, and it will be loads of fun with lots of free drawings for cool stuff! The idea of the Holiday Hop is to roam the downtown with like-minded, upbeat holiday carousers, see all the decorations, stop in at businesses, make merry, hear talented singers, sit on Santa’s knee, and support the whole crazy notion of Pottstown having a lively commercial center!! 5-6 PM Meet-up at The Gallery on High at 254 High St.(NOTE NEW LOCATION) for their Annual Holiday Party & meet legendary Pottstown Firebirds football champs!! Get your free Positively!Pottstown Santa hat! Win a Firebirds t-shirt! 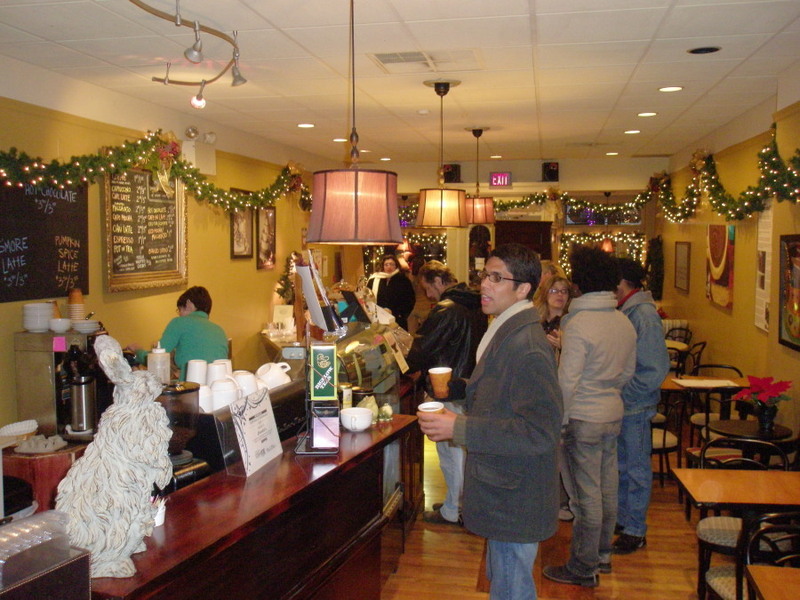 6-6:30 PM Stop in at Grumpy’s Handcarved Sandwiches & decorate an ornament for the Borough tree! 7:45-9 PM Head to Smith Plaza at catch the Pine Forge Academy Choir, hang your ornament on the Borough tree, sit on Santa’s knee, free drawing for 2 carriage rides down High Street! Wind down with warm drinks & dessert at Churchill’s! 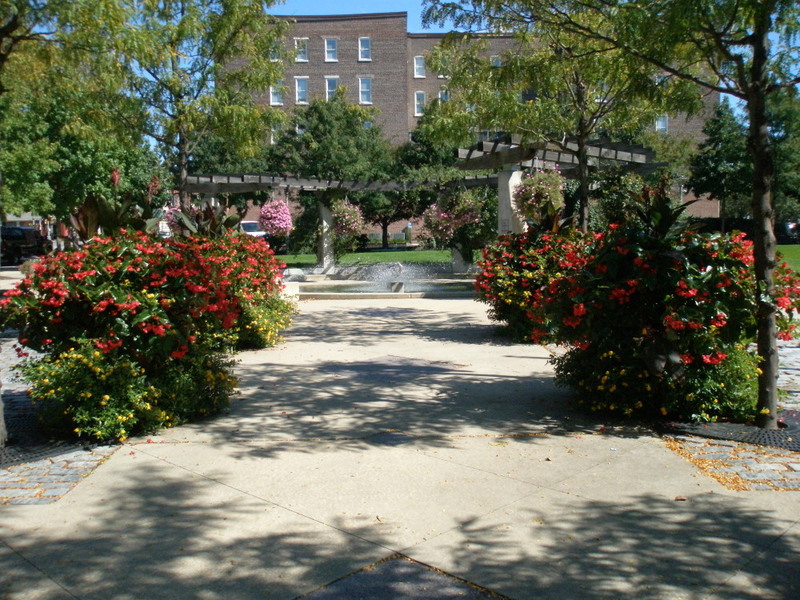 The Smith Family Plaza, together with Pottstown’s Borough Hall, was named a Bronze Award Winner in 2006 by the 10,000 Friends of Pennsylvania. 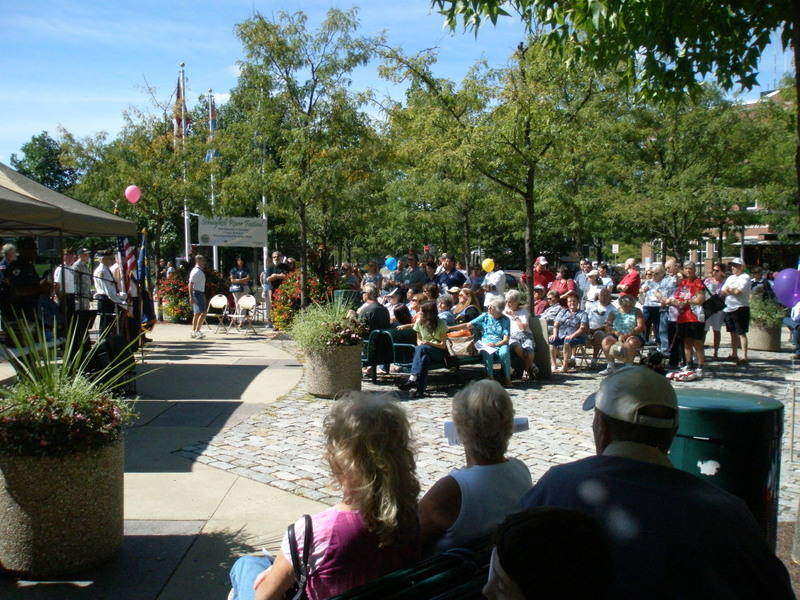 Since then, this open, pleasant and visually-harmonious town center has become the gathering place for First Saturday celebrations during warm weather months as well as other community events, such as the recent September 11th remembrance service and kick-off to a daylong “Open Doors” event. 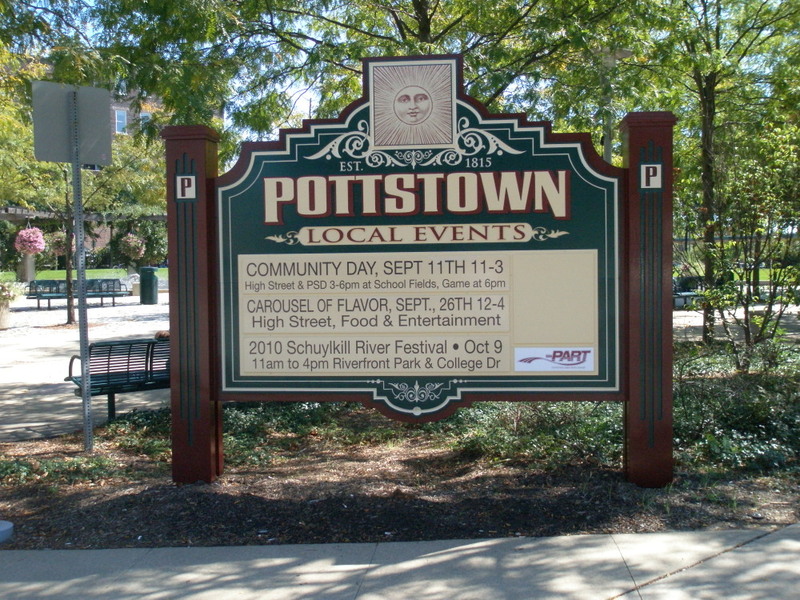 First Saturdays in Pottstown are held from 10 a.m. – 2 p.m. on the first Saturday of the month from May-September. They are organized by the Pottstown Arts and Cultural Alliance and typically include non-stop music, community tables, arts activities, and a used book sale by the Pottstown Regional Public Library. Across the street and within a 2-block radius of Smith Plaza, you have your choice of restaurants. And speaking of food, the Smith Family Plaza is at the heart of the Carousel of Flavor culinary festival, which just passed the seven-year mark this past weekend. This celebration of food, crafts, art, and live music allows residents and visitors to sample some of the best cuisine available in the region. It is organized by the non-profit Carousel at Pottstown and benefits their carousel revitalization project under construction at 30 W. King Street. But I like Smith Plaza even after the crowds go home. The lawn is beautifully-manicured and the lush landscaping makes this public space feel cool, safe and inviting, even on the hottest summer day. It’s one of just a few areas in Pottstown with free WiFi, so if you’ve got your laptop and absolutely have to check your email, this is the spot for you. I also have a healthy respect, and a kind of awe, for well-designed government buildings, so a seat in the shadow of Borough Hall suits me just fine. Suitability: All ages can enjoy this public gathering space for community celebrations, passive recreation and connecting with nature. Facilities: fountains, small multi-purpose lawn, concrete plaza, benches in sun and shade, people-watching areas, historical marker, seasonal flowers. Activities + tips: The fountain will be tempting to all, especially young children, but no one’s allowed in! Even though there is no playground equipment, the parents of the stroller-crowd might want to grab a specialty coffee and pastry from across the street at Churchill’s, and then enjoy a moment of peace while the little ones doze. 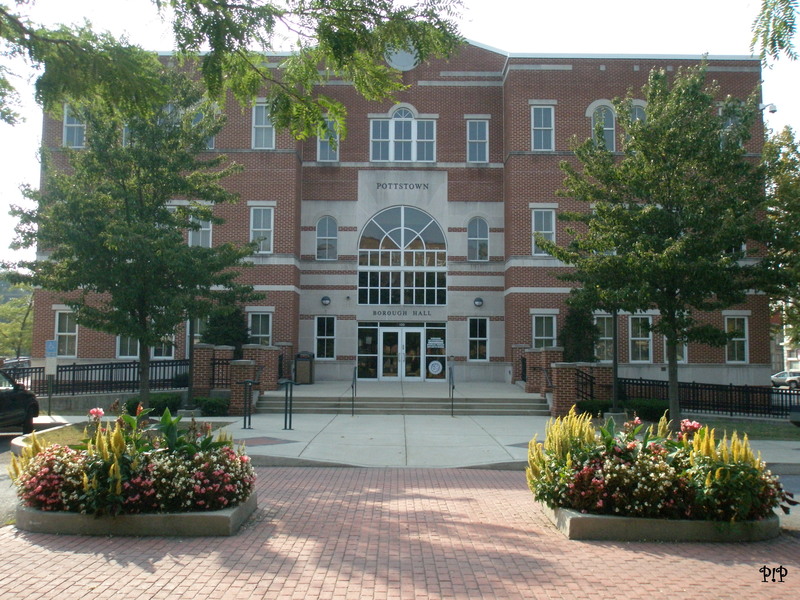 Click on the Department’s “Special Events” tab to learn more about upcoming events. Follow the parks series at Mission: Healthy Living, Positively!Pottstown, Twitter (PositivelyPtown), Facebook, and The Mercury.